Death, and the fear of death, is the theme of both works on this disc. In 1824, Schubert knew his rapidly declining health would lead to his premature death. ‘I am the most unhappy and wretched creature in the world … whose health will never be right again’ he wrote to a friend. 85 years later, Sibelius underwent thirteen operations for a tumour in his throat. 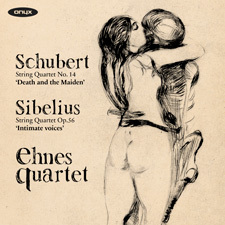 His bleak and powerful Symphony No.4 and the String Quartet ‘Voces intimae’ are the two masterpieces from this troubled period.